In 1903, Mr. G.T. Haggard established the Haggard Furniture Company in downtown Jefferson on Austin Street, after graduating from Sam Houston Normal Institute. Mr. Haggard not only sold furniture but also sold caskets out of his store, which is now River City Mercantile. In 1908 he became a licensed Funeral Director and Embalmer, doing most of the embalming in the home and having the funerals at the residence or in a church. In the 1930's, a building located on the corner of Walnut and Clarksville Streets was purchased, and the funeral home was moved to that location, while the furniture store continued operation downtown. George Earl Haggard, the son of G.T. Haggard, attended the American Academy of Embalming at New York City, and became a licensed funeral director in 1940. In the mid 1950's, the home of Captain William Perry, who had been a riverboat captain in the 1840's and 50's, was purchased and was moved from its original location one block away. 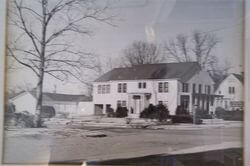 The building was connected to the original funeral home building, and the two combined buildings were dedicated on Sunday, December 8, 1957. Many of the antique furnishings that were placed in the building at that time are still in use today. George Thomas Haggard, G. T.'s grandson, attended Dallas Institute of Mortuary Science, and became a licensed funeral director in 1975. Several years prior to the grandson's licensure, the Haggard family had moved to Colorado to pursue another business venture, and, over the years, the funeral home management was under the direction of various managers. In 1997, the funeral home was sold to Carey B. Heaster, Jr. who had managed the firm since the early 1980's. Mr. Heaster operated the business until Paul Morehead purchased it in November 2007. The caring and experienced professionals at Haggard Funeral Home are here to support you through this difficult time. We offer a range of personalized services to suit your family’s wishes and requirements. You can count on us to help you plan a personal, lasting tribute to your loved one. And we’ll carefully guide you through the many decisions that must be made during this challenging time.